We pick up with this series where we left off, back in November, from issue 18 to now 22. Let’s find out what has happened in the meantime. Inside front cover is an ad for the 2007 Chevy Aveo. Since marrying Storm, Black Panther has had to go around, shoring up allies and making sure Wakanda is still a viable first world country. They have visited Doctor Doom in Latveria. They went to the Moon to visit the Inhumans. Last issue, they went to Atlantis to pal around with Namor. Three issues, three visits. Issue opens with Jim Rhodes, of War Machine fame. Currently, he is leading the O*N*E program, as a favor to Tony Stark and because General Lazer asked him too. Rhodes isn’t happy about the Sentinels keeping watch over the X-Men, at their own home. As Tony’s friend, Rhodes is Pro-Registration. He likes how it doesn’t just focus on mutants or superhumans, if you want to be bigger than yourself and help the world in the big leagues, you have to get registered. London, England – on the Thames. Storm and Black Panther are visiting Captain Britain. 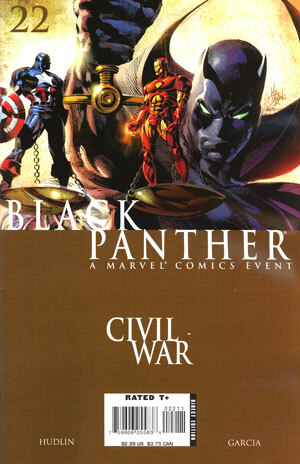 Black Panther is asking Brian about his stance on the Civil War. T’Challa wants to openly come out against the Act. Storm mentions how Brian has worked alongside mutants in the past, and should know how quickly the government can turn on a group of people. Brian isn’t going to go along with them, on this quest. Even though he isn’t giving the newlyweds what they want, he asks if he can get the Ebony Blade back. 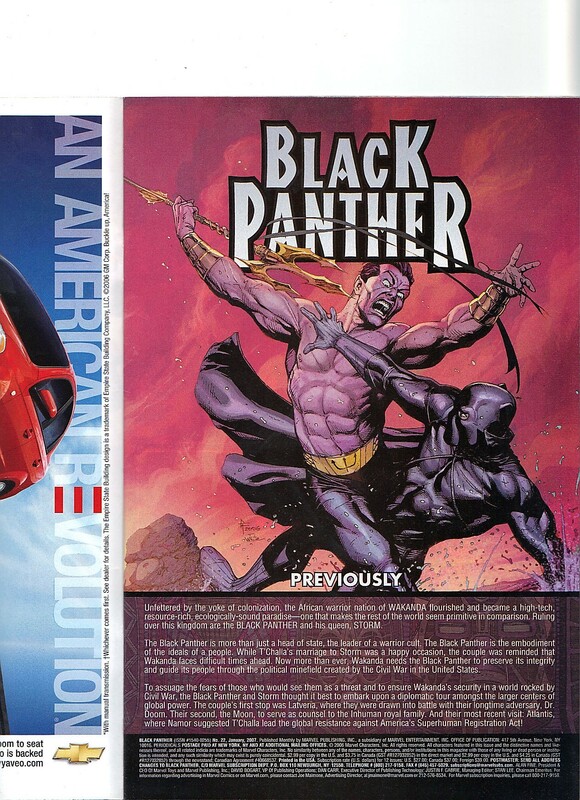 Since an assassins tried to kill him with it, Black Panther isn’t quick to give it back. Gears of War is coming to XBox 360. I played it but wasn’t that thrilled by it. Next, they go to Rwanda to give artificial limbs to maimed children. We see Everett Ross, who must be working for Stark. I really liked him from Christopher Priest’s run. The newlyweds’ next stop is America so they can visit with Oprah and President Obama. Casino Royale is coming to theaters. T’Challa explains his plan to Ororo. They are building public support and their lobbyist will state how the registration is more big government intrusion into the lives of Americans. Thirdly, and this one is silly – he has brokers trying to buy a majority share of Stark Enterprises, which there is NO WAY Stark doesn’t have it so that he can never lose majority share. T’Challa knows this and expects Tony has a point pill style defense. He asks how her call with the X-Men went. It didn’t go well. Emma breaks the news to Storm, the X-Men have promised Stark that they are going to stay neutral during this war. The war is a distraction from the whole Decimation fallout. Emma makes the perfect argument that almost all of the X-Men don’t have secret identities, so registering isn’t a big deal. Kitty overhears this and isn’t thrilled. Meanwhile, at the White House. A crowd of both supporters and naysayers have gathered. There is a half page ad for the miniseries, Bullet Points, that I have to buy the fifth issue. The other half is to promote Speed Racer Volume Five. That is followed by a double page ad for the Nissan Sentra. Meanwhile, at the Sentinel Command Center. Rhodes is talking to some other guy. Rhodes is here to help Tony, he doesn’t have an opinion on Black Panther. Rhodes doesn’t have any problems taking down Captain America. At the White House. Before Black Panther and Storm can meet the president, his staff wants Storm to register. T’Challa doesn’t have to sign as he isn’t an America but Obama can’t meet with superpowered folks until they are registered. Panther addresses Stark, through a camera, which confuses the lower level staff members. The new power couple decide to turn and leave. Two Wakanda guards come down on flying chariots. The no-fly zone over the White House, prevents a proper plane from picking them up. The supporters at the gate can’t believe Black Panther was enraged so quickly. A riot breaks out, and Black Panther tries to quiet the noise. Since Black Panther is making an “aggressive” move, this gives the military their excuse to open fire on him. This annoys Storm and she throws down the lightning. Now that Storm used her mutant abilities, that gives O*N*E their excuse to engage. Now a fight has broken out. There is a page with two ads, the top half is X-23 : Target X 1 by Craig Kyle, Christopher Yost and Mike Choi. The other half is Star Trek The Animated Series, coming to DVD. Not a bad show, from my memory, classic episodes given the animated treatment. 22 episodes on 4 DVDs. There is also a double page ad for the Honda Element SC. In a brief calm, we see that Rhodes has fallen out of his Sentinel. These Sentinels do look like they were given some Wakandian flair. There is a three quarter page ad for Immortal Iron Man 1 by Ed Brubaker, Matt Fraction and David Aja. The ad on the far right of it is the Honda Element SC, so they must have spent some money for all of this space. The supporters were about to attack Rhodes when Black Panther saved him. Rhodes recognizes the irony of being saved by the man he is there to arrest from the people he was there to protect. Tom Clancy’s Rainbow Six Vegas gets an ad, coming to Playstaton 3 and XBox 360. Iron Man arrives, not thrilled that his friend is beaten in front of his enemy. Panther tries to explain that he is helping but Iron Man doesn’t need any royal help. The two of them get into some heated words. Panther flies away on one of those chariots and Iron Man takes off after him. Iron Man is about to punch Storm and Black Panther, in the outfit that would be his alternate uniform in Ultimate Alliance 2, jumps out of the plane with the Ebony Sword. The sword makes short work of Iron Man. Back on the ground, Iron Man is ready to end this but Rhodes speaks up about how everyone should just walk away. Iron Man agrees, as Panther has a country to go back too. Except he isn’t going back there, he and Storm will be staying in America. Mail to the King! Letters from – Jackie Williams of Louisville, NY / Veronica Rodriguez / Andre Clark of Brooklyn, NY / Jordan Hofter of Monmouth, OR. Inside back cover ad is for Thomas Jane’s Punisher, now on DVD. Such a good film! Back cover ad is for the Dodge Caliber. I literally only own this issue because Magik is listed as one of the dead members of Exiles. They are listing the dead due to Mimic being the latest dead member. Which causes Blink to be pretty sad as he was her boyfriend. Magik died in issue 44, so it has been a while but like her proper Marvel counterpart, she was great enough of a character to keep being mentioned and remembered from time to time. Since she’s mentioned at the very beginning of the issue, my memory of the rest wasn’t that clear until this reread. I don’t own the second part so we all will have to be in suspense. I do own issue 83, so the recap will will day explain what happened and the significance of it. Exiles had this massive World Tour storyline from issue 69 to 82 and this is the only issue I own of it. 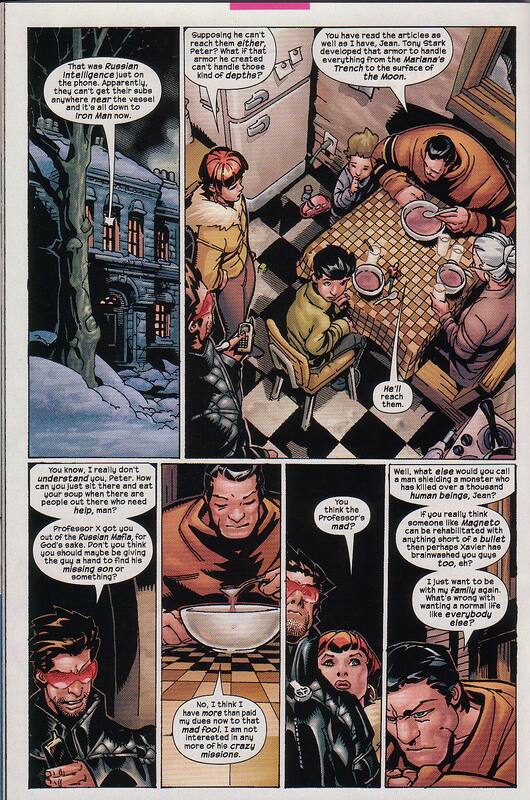 The plot of it was that due to that foul Scarlet Witch and House of M, in that universe, Proteus was reborn. So he was bouncing from alternate universe to alternate universe. Luckily, Marvel has a team that specifically deals with that type of adventure – Exiles. So the worlds that are visited are – House of M, New Universe, 2099 (where they pick up Spider-Man 2099 as a member), Squadron Supreme (where they pick up Power Princess as a member), Future Imperfect, and finally Heroes Reborn. Which really, should be the point of Exiles. 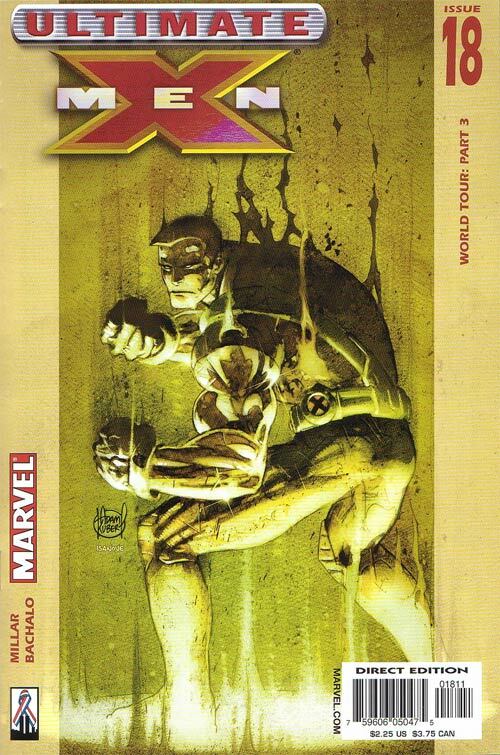 Sure, they can have their new dimensions and adventures but with the vast history of Marvel and how popular What If was, they should be revisiting already established universes, at least once in a while, revisit some beloved ones. Which they did and definitely did here, in a big bad way. I missed all of those issues so there’s that. The deal with Proteus, is that he is such a powerful character that he burns up the bodies he has taken over. That’s how he killed Mimic, he tried to use him as a host body. So Proteus went into that body and then bounced around alternate Earths, finding bodies and losing bodies until finally settling into Exiles’ very own Morph. They tricked him into believing that he really is Morph so that’s how all of this ended. The Exiles at this point are – Blink, Heather Hudson, Longshot, Power Princess and Spider-Man 2099, the least amount of members they have had since the title started. Issue opens with a remembrance of the dead – Magnus (the first fallen), Thunderbird, Sunfire, Magik (!) and Namora. They are not even shown on panel, what type of comic is this? Blink is pretty down, as Proteus killed Mimic and now essentially, Morph is dead, all because she gave up leadership to Power Princess. Not only is Morph dead but Proteus is in his body and Morph’s body is extremely powerful and due to its shape shifting abilities, can sustain Proteus forever – most likely / probably. So they lost an ally and gain an even stronger threat. Not an ideal outcome. In the Panoptichron, the Exiles land back inside the pink crystal palace and Blink immediately takes off for Heather. Heather tells Blink and the team that Proteus is heading back to his home world of Earth-616, the Proper Marvel Universe. Luckily she was able to trick him into actually going to Counter-Earth – which at this time orbits the sun on the opposite side of Proper-Earth. Heather makes a quip about how it is a long story and boy it is! They deal with the origins of it so I’ll repeat it then. On Counter-Earth, Proteus is freaking out as he is standing on the torch of the Statue of Liberty and New York City is under water up to the nose of the statue. Last time he was on 616, it was the House of M version and it has since reverted back to how it was meant to be but he doesn’t know that. Since he took over Morph’s body, he also has his memories so he is going to figure out soon that this isn’t the right Earth, Heather warns. Proteus dives under water and meets some Atlanteans who are getting ready to attack the floating island of Attlian. I do like how when he speaks, he has a Scottish accent – that’s good attention to detail! Heather informs the Exiles how Counter-Earth could have an atomic bomb drop on it and it wouldn’t notice as the world has been constantly hit with disasters. Blink takes back leadership of the team and tells Power Princess that she is important to the plan. In a fun comic book gimmick, Proteus hears ‘Attilan’ as ‘Atlantis’ which in print, of course it is two different words but in the reality of the comic, they would sound alike. Or at the very least, when you are underwater speaking to someone from Atlantis, your brain is already anticipating someone to say the word so Attilan would play with the ol’ hearing sensors. Heather keeps informing the team about who they can expect to meet once they get to the surface. Heather mentions the team, Young Allies, Blink doesn’t recognize the name and realizes she needs more information. The comic itself does not do a good job of explaining who the cast of Young Allies are. We get to see members use their powers and such but there is no one page of introductions or captions. During this, Blink calls Sabretooth, Victor, and he notices it as she usually calls him, Mr. Creed – as they are both from the same Age of Apocalypse timeline. They are slowly becoming peers, or Blink is finally accepting full responsibility of the team. Blink orders Sabretooth and Longshot to Counter Earth to track down Proteus. Spider-Man 2099 and Power Princess have left to accomplish their side of the mission. Back on Counter-Earth, Bucky (Rikki Barnes) isn’t happy with their current circumstances. She is trying to make a deal with Dorma, the Queen of Atlantis. Her goal is to start getting fresh fish to feed everyone on Attilan. The Young Allies are shown, they are – Bucky, Jolt, Kid Colt, Toro and Order & Chaos. I only really know Bucky and Jolt. Bucky was Heroes Reborn’s Captain America’s new Bucky once he woke up in the then present day. Jolt, I know from the amazing Kurt Busiek / Mark Bagley Thunderbolts run. I haven’t really kept up with her adventures once she left that team and I definitely haven’t kept up with Counter-Earth since that like nine part Doom event when Doctor Doom ruled the entire planet and brought it out from the Pocket Universe Franklin Richards created and brought it to orbit the sun in the Proper Marvel Universe. Then all of a sudden the Statue of Liberty itself grabs the floating island. This shocks everybody, naturally. Proteus reveals himself to the young heroes. At first, I thought he had used Morph’s power to turn into the statue but then we see him standing on Attilan with the statue still in the background. Proteus used his reality warping power to move the statue. Proteus wants to make a deal with the Young Allies. He has already stopped the attack from the Atlanteans so now he wants their help to stop the oncoming threat of the Exiles. Over on the Squadron Supreme world – which the Exiles visited earlier and I haven’t read anything from since the classic Mark Gruenwald’s original Squadron Supreme limited series. The team has appeared in various Avengers comics that I’ve read since then but the world itself, I’m not current on. Then there was the JMS’ Supreme Power which was like the Ultimate Squadron Supreme world or it out right replaced it, I’m not sure. I just looked it up, and it is an alternate timeline (more modern version) of the Supreme Squadron – so it is an alternate take on an alternate take. Does it have to be this complicated? Reminds me of this version of Spider-Man 2099, who is from an alternate 2099 but the only difference is that he comes from one that could be used in Exiles that wouldn’t tarnish the original Spider-Man 2099 from any future storylines. As if Peter David would be mad about it or something. Regardless, Power Princess and Spider-Man 2099 show up to the Squadron Supreme world, as Nighthawk is dismantling the infamous brain washing chairs. Before they arrive, Whizzer is giving Nighthawk some grief. They teleport in and we get my favorite page of the comic. It all takes place on one page, with six panels. Nighthawk to the far left, Spider-Man 2099 to the far left, and Power Princess standing close to him on the left side. We only see their heads. Spider-Man 2099 notices the legendary chairs and Nighthawk is both offended and quick to express how they are being dismantled. Nighthawk can’t believe Power Princess is back so soon, she tells him that she was success, he knows she is lying. She knows that no matter what, he will make this difficult. 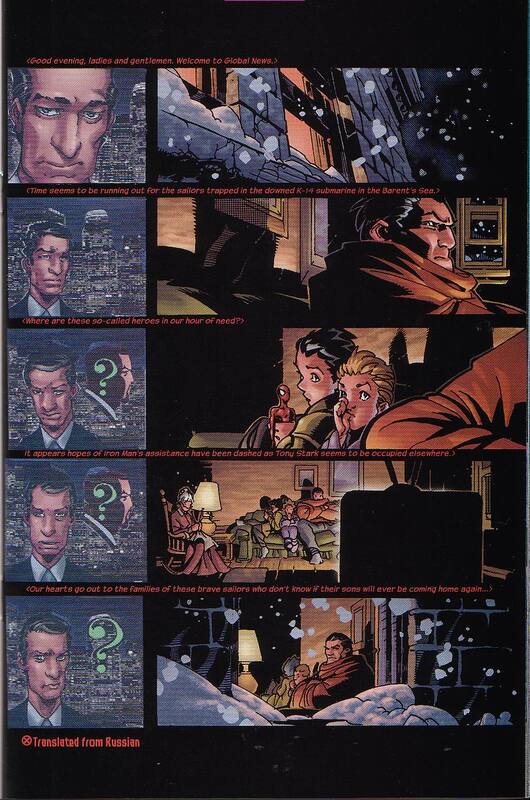 The page ends with her hitting Nighthawk with her shield. Spider-Man 2099 takes off his mask to take a good look at the chairs. Which is odd, as shouldn’t he be able to see the chairs through his mask like how he sees everything else? Who is he, Movie Spider-Man? Spider-Man 2099 believes he can do as Blink wishes and modify the technology. Back on Counter-Earth, Proteus gets the origins of the planet. 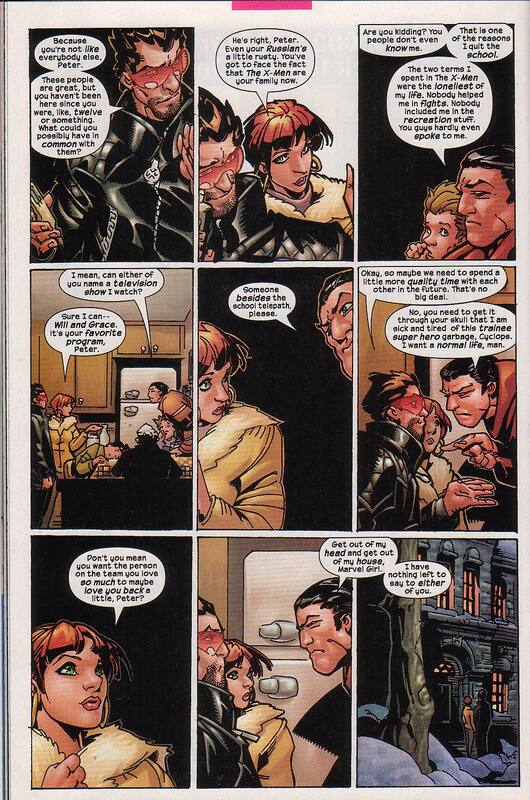 Amazingly, Bedard is able to get through it in one page, that’s what you can do with an artist like Calafiore. Proteus learns that the planet has dealt with earthquakes, cosmic storms and nuclear wars. They make a joke about how bad things have to be when Doctor Doom is your best option. Which really, is unfair, if it wasn’t for that cursed Reed Richards, Doom would have made the world a better place by now. Maybe not for the bigger cities or New York in general but Montana would be fine. Then Doom left the planet and without a strong presence, the world has been up for grabs. Young Allies go around trying to save refugees and try to make living bearable. I like how Bucky ends the tale with trying to gauge Proteus’ reaction to all of this as it must sound pretty confusing. Proteus tells her that he’s traveled to several alternate Earths and all of them have their unique issues. Bucky asks how they compare to other Young Allies that he has met, and he tells her that he has never even heard of the group before. 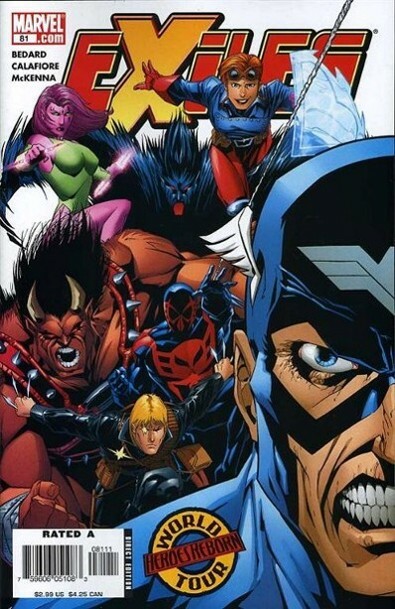 To make a point, Proteus shifts into the Heroes Reborn Captain America, as shown on the cover, who only real difference is that instead of an A on his forehead, he has an eagle. Proteus claims that he isn’t familiar with this character, and asks for his name. Bucky tells him that is Captain America and to please unshift from that form. I have to remind myself that this Proteus is from the House of M timeline wherein Cap had lived out his days from WWII and so he appeared to be an 80 year old man. But he was still Captain America but I’m not exactly sure what House of M’s Proteus’ back story is. Jolt ends the scene asking about what Proteus meant about his enemies. Sabretooth calls Heather, wanting to know if Power Princess and Spider-Man 2099 have made it back. She tells him no. Sabretooth tells Longshot how he is able to track Proteus. Apparently, Morph doesn’t have a scent, so he stands out. He makes a very odd analogy of how Morph’s body stands out like a black and white character in a color movie. Shouldn’t the comparsion be a color character in a black and white movie? A black and white character in a color movie would look like a white person in a black suit, which we all learn from Pleasantville, isn’t much of a real difference. That film came out in 1998, so Bedard has had eight years to watch that movie and it is a good film, at that. It is suppose to be a throw away line but it stuck out to me. Spider-Man 2099 and Power Princess arrive at the crystal palace. Spider-Man 2099 holds up a headband, he has successfully made the modification. Phase Two can begin. Sabretooth and Longshot get attacked, the ground beneath their feet crumbles and they have Kid Colt pointing a gun at them. Longshot has to fight off Toro, a big red bull of a man. Longshot throws knives at Proteus and Bucky blocks them. Longshot asks why they are protecting a murderer to which Bucky counters with an awesome comment about how Longshot is the one throwing knives. Which is a great point, one doesn’t use knives as a weapon unless you want to cut or slash people. It is a pretty violent weapon that doesn’t serve any non-violent purposes. Proteus points to Longshot, stating he is the main threat and Jolt fries Longshot. The Exiles show up, and with Longshot unconscious, Proteus can really unleash his wrath. Doing so, makes the Young Allies realize they did in fact back the wrong horse. Proteus does what the original one did to Wolverine back in the Proteus Saga, and warps the Exiles’ bodies out of sorts. Which I know that is a comic book device, but how does one even survive that? By sheer will on the part of Proteus? I know it messed up Wolverine for quite some time afterwards. Once Proteus reveals this side of his personality, two giants appear. Order and Chaos, I like how their appearance takes place over a two page spread. Chaos, a shadowy male, gets the left page and Order, a green lady, gets the right page. Counter-Earth has been tipping on the scale of chaos and order, and Proteus has finally flung it into one direction. They grab him and all three teleport away. Bucky states their names as, Order and Chaos, as Jolt explains how they have been ordinary members of their team and never shown a power display like this before. Toro further explains how they are usually their size and not giants. Kid Colt (this is an all hands on deck type of reveal explanation) explains how in the past Order and Chaos have gone on about how they are here to judge the planet but it never amounts to anything. Bucky apologizes for taking a clear villain’s side in the fight. It is the least she can do. Blink explains that that is what Proteus does. He goes to a planet first, gets the heroes on his side and then those heroes fight the Exiles. Hero types, if you get to them first, they will always fight a fellow hero without warning or questions. Sabretooth tries to call Heather and there is no response. Cut to the crystal palace – I really don’t like typing Panoptichron over and over and they usually refer to it in the comic as crystal palace – Heather can’t connect to the team either. Issue ends with one of the Timebreaker bugs (who actually run the machinary under Heather’s direction) explains to Heather that Counter-Earth shows signs of destruction. The line is very dramatically delivered as it is shown as a half page panel that is a close up of the bug’s eye and we see Heather’s shocked reaction reflected. I can tell you this, Counter-Earth survives as I know it is there for the Onslaught tenth anniversary miniseries written by Sean McKeever. Then from there, anything can happen. I can also state that Spider-Man 2099’s device does eventually work and it sinks into Morph’s head becoming a part of him and he continues living his life as if he is Morph.